It's easy to find black people at Condé Nast: They're in the mailroom, the cafeteria, holding Anna Wintour's umbrella... and on the cover of Men's Vogue! Jeff Bercovici of Portfolio points out that 4 out of 12 covers so far have featured black men. Meanwhile, when Jennifer Hudson graced the cover of Vogue in March, she was only the third African-American celebrity to do so. Keep in mind that the magazine was founded in 1914. 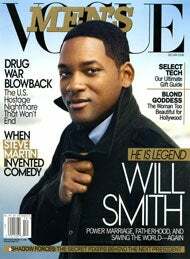 Men's Vogue started in 2005 and so far has had Tiger Woods, Barack Obama, Denzel Washington, and now, on the December issue, Will Smith. Why is it that Men's Vogue has had more black celebrity covers than Vogue itself? Who Does &apos;Vogue&apos; Editor Anna Wintour Think She Is? P. Diddy? Covers with black people supposedly don't sell as well, but Men's Vogue editor in chief Jay Fielden tells Portfolio, "I don't think that Tiger or Senator Obama appeal only to one segment of the population. In fact, they proved to be two of the best-selling covers we've ever done, and we have good reason to expect even more from Denzel Washington and Will Smith. If there is some industry rule of thumb that you can't have African-Americans on the cover more than so many times a year, then we're glad to be the ones disproving it." Hmm, do we smell a Fielden/Wintour showcase showdown?